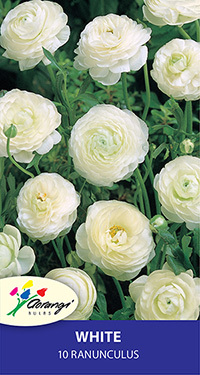 Our European ranunculus are superior quality, fully double flowered. For best germination, chill for four weeks at 4°C and then soak the tubers in water for an hour before planting. 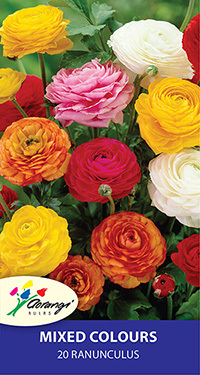 Once growing, feed ranunculus well, but avoid fresh animal manure or other high nitrogen fertilisers. Do not overwater. A mixture of colours, all fully double flowering. This mix is in the larger 4/5 grade. 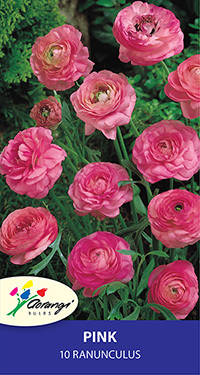 Fully double flowering pink ranunculus. Absolutely delightful. Pack of 10, size 4/5. Minimum order 25 tubers. 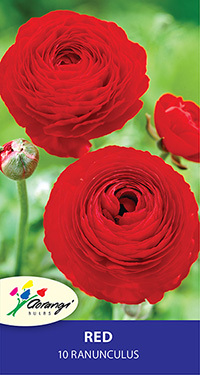 Fully double flowering red ranunculus. The perfect flower to add a pop of colour to your garden. Pack of 10, size 4/5. Minimum order 25 tubers. Fully double flowering orange ranunculus. Very vibrant colour and makes an excellent cut flower. Pack of 10, size 4/5. Minimum order 25 tubers. Fully double flowering white ranunculus. Perfect for wedding bouquets. Guaranteed to add an element of elegance to your garden. Pack of 10, size 4/5. Minimum order 25 tubers. 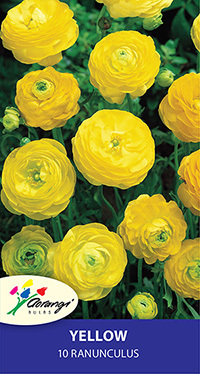 Fully double flowering yellow ranunculus. Vibrant yellow petals will create a spectacular sunny show in your garden. Pack of 10, size 4/5. Minimum order 25 tubers.